Positions of endogenous Cys388, Cys1439, and Cys1497 (represented by black spheres) in (A) cryo-EM structure bMRP1 (205–1516 aa, PDB ID: 5uj9) and (B) Sav1866-based hMRP1 model (300–1531 aa). The sequence of hMRP1 is 91% identical to bMRP1. According to the sequence amino acid, Cys, in human and bovine proteins located at the position 388, however Cys 1439 (hMRP1) is located at position 1438 in bMRP1 protein, as well as Cys1479 is at 1478, respectively. Cys388 is situated in TM7; Cys1439 and Cys1497 are located in NBD2. Images were created using PyMOL software (Delano Scientific LLC, San Carlos, CA) The hMRP1 model was aligned to the bMRP1 structure using align tool in PyMOL automatically. (A) and (B) show protein molecule from the same view point. Location of endogenous and introduced Cys residues. Shown is the α-carbon backbone in ribbon representation, as viewed from the extracellular face of the membrane. Residues are depicted in similar colors in three structures as endogenous C388 in red, and mutated residues I1193 pink, Y1190 orange, E1144 yellow, S1145 sand, T1082 green, D1081 light green, and R433 blue in (A) human MRP1 model (closed conformation) (DeGorte et al., 2008), (B) cryo-EM structure bovine MRP1 (open conformation, PDB ID: 5uj9) (Johnson and Chen, 2017). (C) Location of corresponding residues in the mouse P-gp structure (open conformation, PDB ID: 4M1M) (Aller et al., 2009). 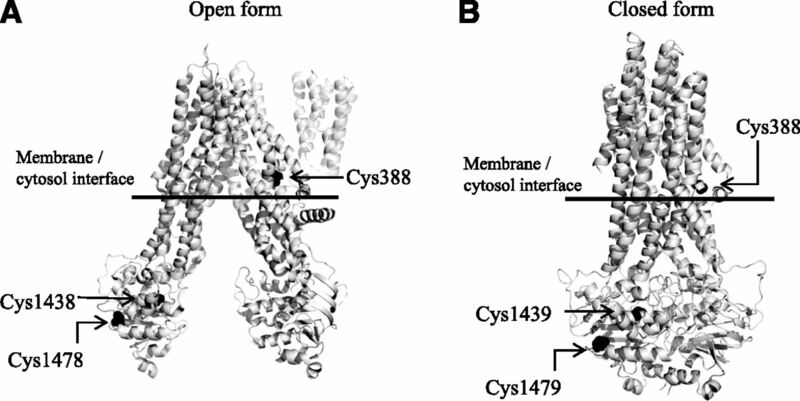 Cross-linking of 3Cys ΔMRP1 mutants containing pairs of cysteines. 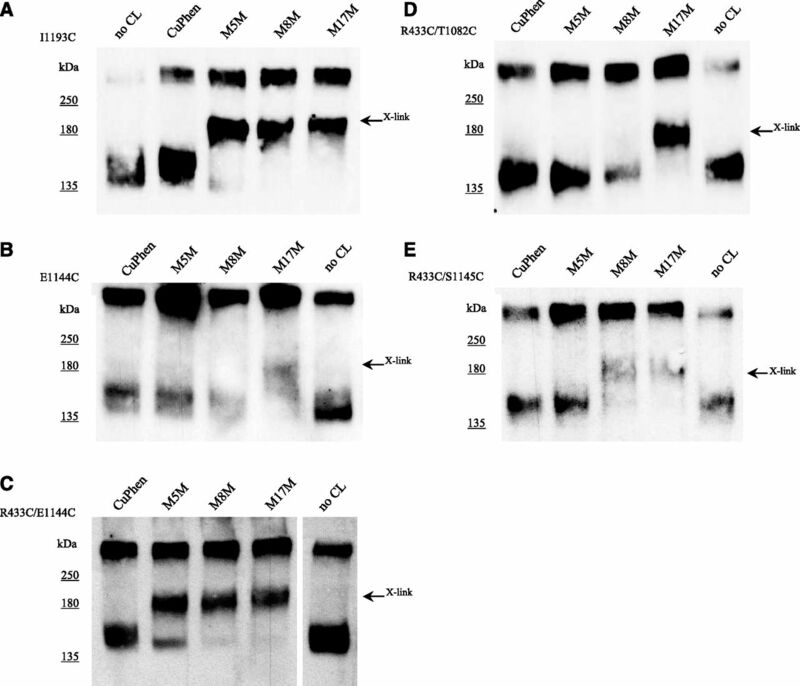 Membranes were prepared from HEK293 cells that expressed mutants I1193C (A), E1144C (B), R433C/E1144C (C), R433C/T1082C (D), and R433C/S1145C (E) of 3Cys ΔMRP1. Membrane sheets were treated without (no cross-linking) and with cross-linker (CuPhen, M5M, M8M, M17M) for 15 minutes on ice. Final concentration of cross-linking reagents in the reactions was 50 μM. Reactions were stopped by addition of SDS loading buffer containing EDTA and no thiol-reducing agent, and samples were subsequently subjected to immunoblot analysis. Membranes were probed with anti-His tag antibody. Representative immunoblot from at least two independent cross-linking experiments is shown. For each protein mutant two independent protein expressions and membrane vesicle preparations were obtained. The position of the cross-linked product is indicated (X-link). Effect of M5M concentration and reaction time on cross-linking of I1193C 3Cys ΔMRP1. Membranes were prepared from HEK293 cells transiently expressing the I1193C mutant of 3Cys ΔMRP1. The membranes sheets were incubated with various concentrations (0–50 μM) of M5M for 15 minutes on ice (A), or with 50 μM M5M for the indicated times (minutes) (B). The reactions were stopped by addition SDS loading buffer containing EDTA but no reducing agent. Samples were then subjected to immunoblot analysis. The position of cross-linked protein is indicated (X-link). Competition of estrone sulfate with cross-linker in I1193C 3Cys ΔMRP1. I1193C mutant membrane sheets were preincubated with various concentrations of estrone sulfate (0–75 μM), 1 mM S-methyl-GSH, and 10 mM MgCl2 for 15 minutes at 23°C. The samples were then cooled to 4°C and treated with 50 μM M8M. The mixtures were subjected to immunoblot analysis with anti-His tag antibody. Densitometric analysis of the immunoblot can be found at Supplemental Fig. SI 3). 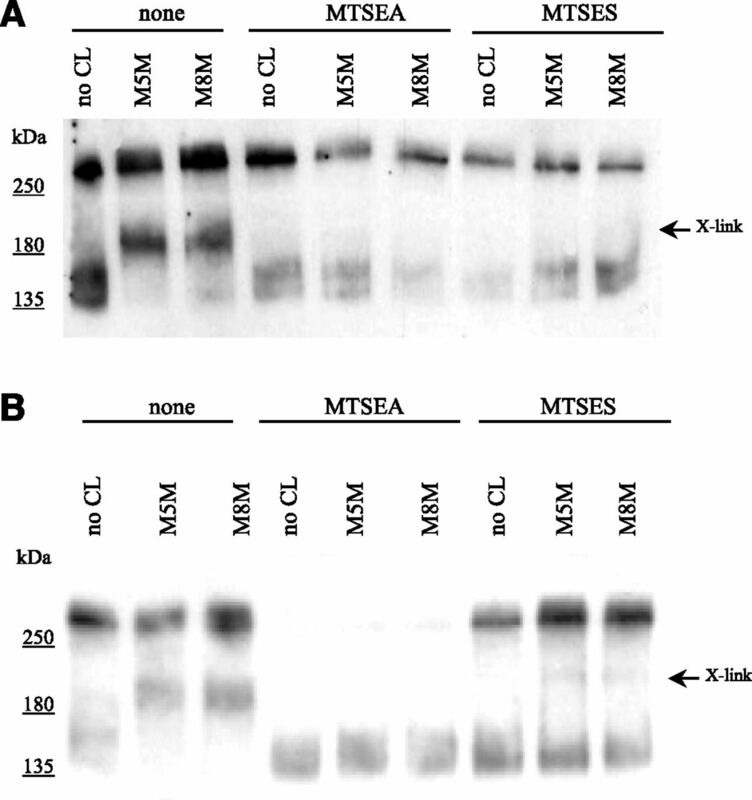 Effect of MTSEA and MTSES on cross-linking in whole cells expressing 3Cys ΔMRP1 mutants R433C/E1144C (A) and I1193C (B). Cells were treated with 10 mM MTSES, 2.5 mM MTSEA, or buffer (none) for 15 minutes at 23°C. The treatment was stopped by dilution with ice-cold PBS and cells were washed with PBS to remove the reagents. Membrane sheets were prepared and treated with 50 μM M5M or M8M, or without the cross-linker (no CL) for 15 minutes on ice. 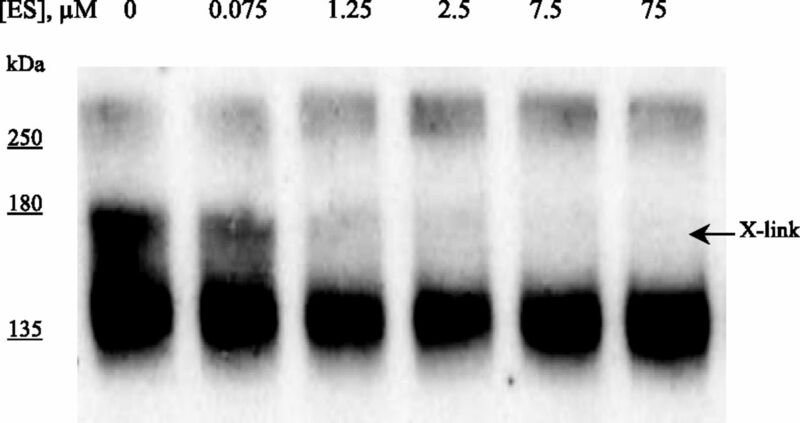 Protein mixtures were run on 7.5% SDS-PAGE gel, followed by immunoblot analysis with anti-His tag antibody. The position of the cross-linked product is indicated (X-link). 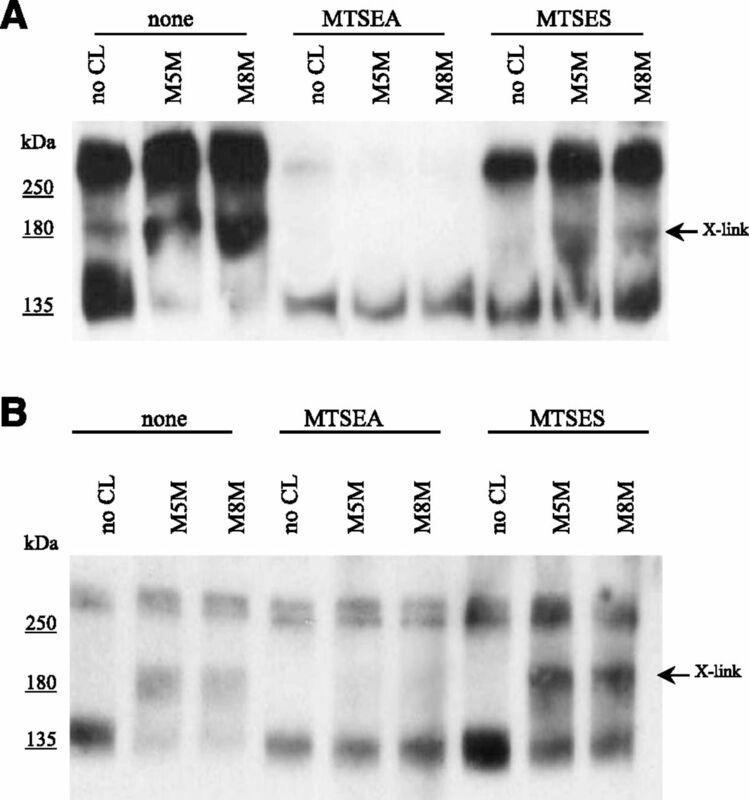 Effect of MTSEA and MTSES on cross-linking of 3Cys ΔMRP1 mutants. 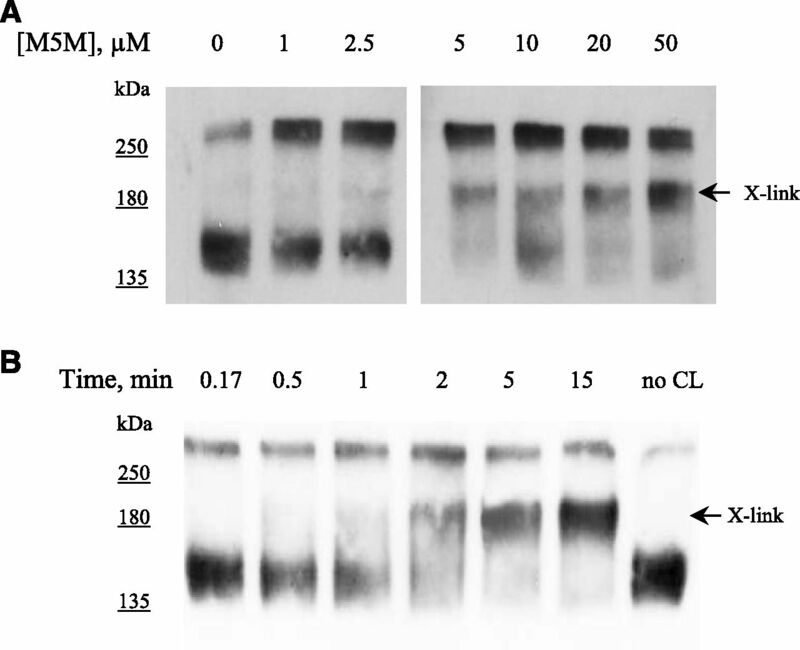 Membranes prepared from HEK293 cells expressing mutants R433C/E1144C (A) and I1193C (B) were incubated at 23°C for 15 minutes in the presence of 10 mM MTSES or 2.5 mM MTSEA, or without either reagent (none). MTSEA or MTSES reagents were removed from membranes using G-50 spin columns. Plasma membrane-rich flow-through fractions were then treated with 50 μM M5M or M8M, or without the cross-linker (no CL) for 15 minutes on ice. The reactions were mixed with SDS loading buffer containing EDTA and no reducing agent, and then run on 7.5% SDS-PAGE gel, followed by immunoblot analysis with anti-His tag antibody. The position of the cross-linked products is indicated (X-link). 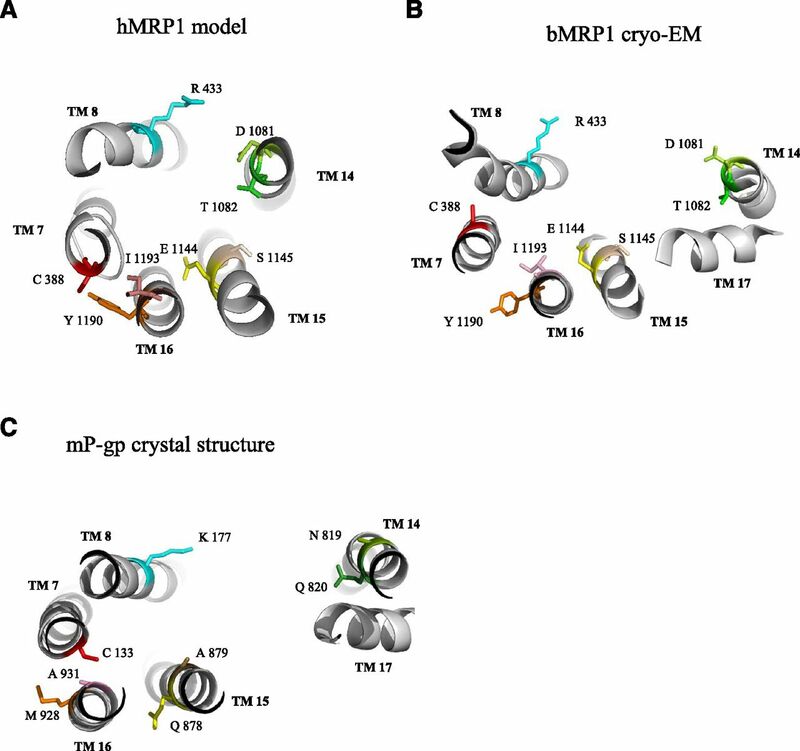 Structural features of MRP1. 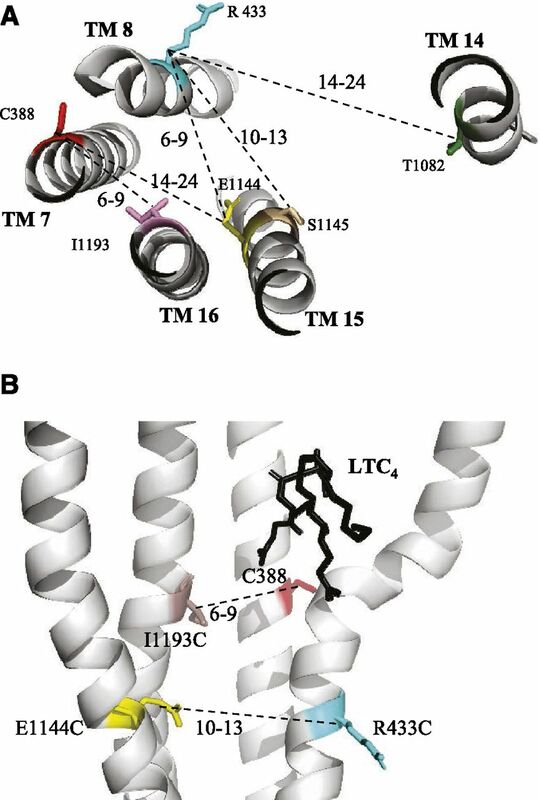 (A) Determining the dimensions of the hMRP1 translocation pore employing thiol cross-linking reagents. Shown is the arrangement of TM helices (on the basis of bMRP1 PDB ID: 5uj9) as viewed from the extracellular face of the membrane. Numbers represent distances (in angstroms) deduced by results of cross-linking experiments using varied-length cross-linking reagents. (B) Spatial arrangement of cysteine pairs (C388/I1193C and R433C/E1144C) in bMRP1 structure in presence of LTC4 (PDB ID: 5uja). Shown is the view from the plane perpendicular to the lipid bilayer. Dotted lines represent a cross-link in each mutant. Numbers correspond to the thiosulfonate reagent that cross-linked cysteine residues in a given mutant. For instance, “5” corresponds to M5M. Dash (–) indicates no cross-linked product detected with any of the three cross-linkers. Empty cells indicate that the cross-linking reactions were not performed.